The .40 S&W, originally manufactured for the FBI looking to replace its handguns with semi-automatics, is now popular with shooters of all types. It's typically flat-nosed bullets have become synonymous with the ideal compromise between speed, weight and power that is the .40 S&W. 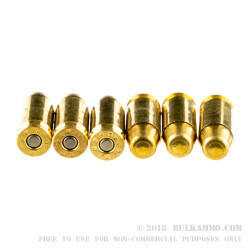 These Metal Case, or FMJ, rounds are perfect for honing your ability to control that power through practice at the range. And, with a case worth, you'll be prepared to practice until you're scoring bullseyes with every shot! These Remington .40 S&W cartridges fire 180 grain Metal Case bullets at 990 feet per second, producing 392 foot pounds of energy at the muzzle. Their boxer-primed brass cases are safe to reload. 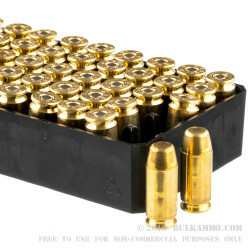 The rounds come packaged in 50-round trays boxed in white Remington cardstock. 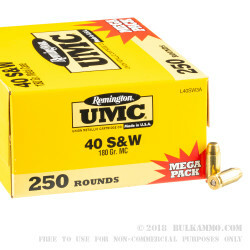 The mega pack contains five trays of ammo. Q: Is the bulk ammo the actual bullet, ready to fire? Or is it components? A: This item includes 250 rounds of loaded ammunition, ready to fire and manufactured by Remington. No reloading steps are necessary. 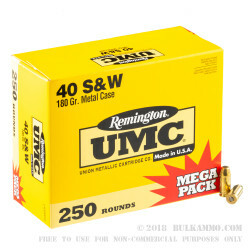 Remington's UMC 40 S&W is a great choice for your .40SW pistol or carbine.